CCK-8 induces a Cl‑ current in nodose neurons. (A) CCK-8 dose-dependently induces a large inward current with peak values at 32.5 ± 6.1, 17.1 ± 5.8, 12.0 ± 2.4, and 13.9 ± 2.8 pA/pF for 10, 1, 0.1 and 0.01 nM of CCK-8, respectively (n = 7–15 neurons at each dose level from a total of 10 ganglia of 5 mice). (B) The CCK-8 (10 nM) induced current in individual neuron is reduced significantly (**P < 0.01) from 30.9 ± 8.3 (n = 11) to 2.5 ± 0.7 pA/pF (n = 13) (obtained from 6 ganglia of 3 mice), by reducing [Cl–]i from 133 to 4 mM. (C) The reversal potentials of CCK-8–induced currents obtained with 133 mM [Cl–]i shows a linear relationship with logarithmic concentration of [Cl–]o, which decreases from133 mM (black) to 68 mM (blue) and 4 mM (red). The corresponding reversal potentials are –3.0 ± 0.4, 4.9 ± 0.3, and 38.3 ± 4.9 mV (n = 3 neurons from 2 ganglia of 1 mouse). (D) CCK-8 induced a rapid dose-dependent increase in [Ca2+]i with a maximal response reached with 10 nM and an EC50 at 1.2 ± 0.5 nM (n = 17–34 neurons from 6 ganglia of 3 mice). 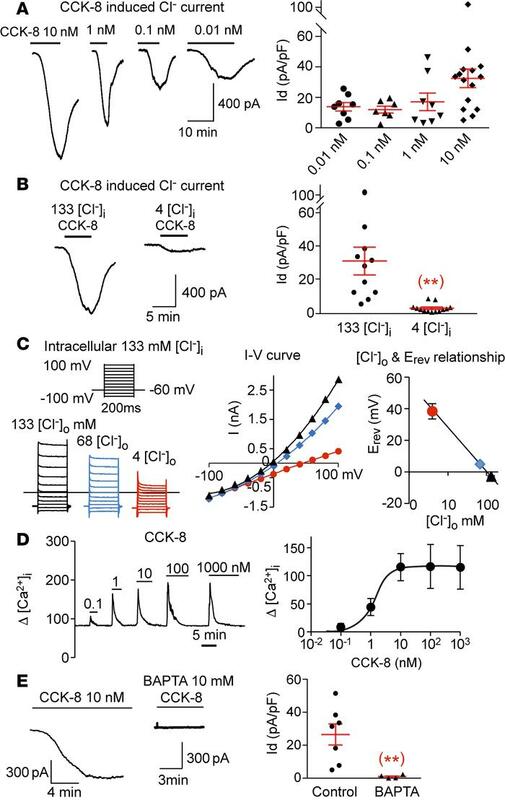 (E) The CCK-induced current is eliminated (**P < 0.01) from 26.5 ± 6.4 (n = 7) to 1.0 ± 0.5 pA/pF (n = 4 neurons from 4 ganglia of 2 mice), with 10 mM of the fast Ca2+ chelator BAPTA in the pipette solution. Throughout, data are presented as means ± SEM, unpaired 2-tailed Student’s t test (B and E). Each data point in A, B, and E represents an individual nodose neuron obtained from a total of 10 mice.